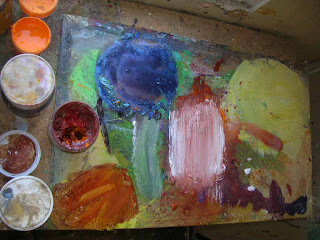 I see spring colors coming out in my work, new greens, bud pinks. Everything feels so peppy, but I need some edge so I turn on music by Massive Attack ~ "Mezzanine". It's the tension between light and dark where art grows. As I paint, I'm aware of painting to stay open, flexible, not letting the piece settle, formulate, coagulate in any 'one way', but to allow freedom to reign. That way I can turn everything upside down (literally) more easily. Grainne Mhaol is coming across the ocean, With armed soldiers as protection, Neither French nor Spanish but Irish, And they will scatter the invader. My greatest wish would be to see, Even if I died within a week of seeing it, Grainne Mhaol and her mighty warriors, Proclaiming banishment to the invader. In process - acrylic, charcoal and pastel on masonite - 48" x 48"
Musical Ambiance: Sinead O'Connor ~ Sean-Nos Nua, Sinead Lohan ~ No Mermaid, Bjork ~ Vespertine, Massive Attack ~ Mezzanine.